My Mother is 87 years old. She came to this country in 1939, from Calabria, Italy. It was early in that decade that her mother made a piece of cloth from raw cotton. It was a long and tedious process. My mother gave me this particular fabric. It was my intention to create a piece that would span three generations. Hence, the cloth, made by my grandmother, with a portrait of my mother, made by me. 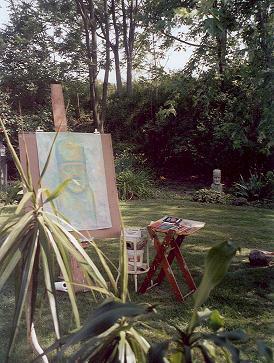 It was a beautiful summer day and I decided to move my easel into the yard. 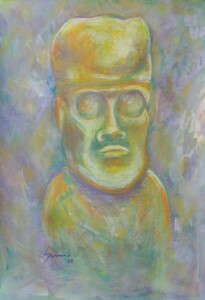 The Tiki sculpture was my subject. I had begun this piece earlier. As the hours passed from morning to twilight, the colors seemed to reflect these moods.